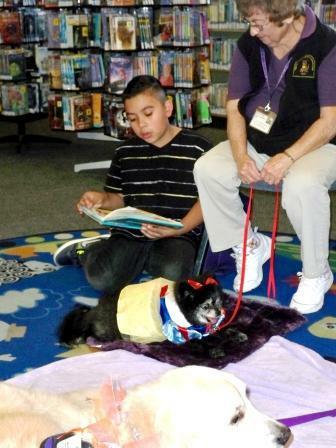 Read to a Dog at Northwest Library/ Leale al perrito en la biblioteca Northwest! Children of all ages, including preschoolers, are invited to read to a dog or tell a dog a story. Earn a free book! ¡Ven a leer en voz alta a los perros de PALS (Paws as Loving Support) para ganar un libro gratis! These well-trained dogs love to listen to stories in English and Spanish. Children build confidence in their reading skills by reading aloud. Estos perros son bien entrenados y les encantan escuchar cuentos en inglés y español. Los niños construyen confianza en sus habilidades de lectura leyendo en voz alta. In the Children's Room @ Northwest Library. En la sala para niños @ la biblioteca Northwest. PALS (Paws as Loving Support) assistance dogs are specially trained dogs who work with children and families within the community in hospitals, care homes, hospice care, schools, libraries, courts, and other approved facilities. See the PALS website for more information!